- RUSSIE – Primorsky - A Buddhist temple, or rather its ashes, have been discovered by archeologists in the Primorsky Region, in the Russian Far East. Given that the temple dates back to the 13th century, its revelation plays an important role for the farthest south-eastern region of Russia. “As a matter of fact, it’s the first Buddhist temple of the Jurchen epoch discovered here. Prior to that, archaeologists have found only Balhae temples of 7th to 10th centuries,” head of the Institute of Archaeology of Medieval History, Archaeology and Ethnography, Nadezhda Artemyeva told RIA news agency. The Jurchen is an ancient people who lived in what is now the Primorsky Territory during the 10th-13th centuries. Experts presume that the temple could have possibly been burnt down during an attack by a hostile tribe. Buddhists from the city of Vladivostok interested in the history of the ancient temple have already visited the site and confirmed the scientists’ point of view. Among the religious objects found during excavation works is a tripot – a vessel on three legs, used in the commission of the rituals as well as some tile and ceramic fragments. - BELGIQUE – Liege - Des archéologues de la Région wallonne et des Français viennent d'identifier la présence d'un groupement d'êtres humains vers 6000 ans avant-Jésus Christ, place Saint-Lambert. Ce sont des tailles très spécifiques de crânes de cerfs, retrouvés sur place, qui ont permis cette découverte, assez exceptionnelle en Europe. Il y a 6000 ans avant Jésus-Christ existait sur le site un atelier de dépeçage de cerfs. Habituellement, on retrouve essentiellement les traces d'outils en pierre. Sur le site liégeois, les dépôts sédimentaires retrouvés ont fait apparaître des restes d'ossements et de crânes, ce qui est assez rare. Jean-Marc Léotard, archéologue à la Région wallonne : "On a là des traces qui nous permettent d'identifier à la fois la présence des derniers peuples chasseurs et pratiquement simultanément celle des premiers agriculteurs". Eva David est archéologue préhistorienne au CNRS en France : "Le site a livré des crânes de cerfs qui sont découpés d'une certaine façon. On a retrouvé la technique de découpe et on sait qu'ils ont utilisé une partie de crâne de cerf probablement pour faire des sortes de trophée. Ça peut identifier le groupe Mésolithique qu'il y a à Tivoli". Les traces de cette pratique à cette période sont extrêmement rares en Europe. Il y a donc de bonnes raisons de continuer à étudier le site préhistorique du Tivoli. - CHINE – Suzhou - Archaeologists in east China's Jiangsu Province have unearthed about 200,000 ancient coins in a well on a construction site in the city of Suzhou. The coins, weighing around 4 tonnes, were believed to be from the Northern Song Dynasty (960-1126), the city's archaeological institute said in a press release. Construction workers found the well and coins first on Wednesday. 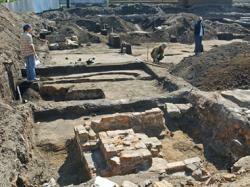 Archaeologists rushed to the site and spent one day digging out coins in a protective manner. < Archaeologists assumed that the large amount of coins might be hidden by some rich family during war in relatively-prosperous Suzhou. The exact source has yet to be confirmed. - USA - Shackleford Banks - A nonprofit marine archaeology company thinks it has found one of the most legendary shipwrecks on a stretch of North Carolina coast famous for them. The three-masted schooner Crissie Wright went aground and partially sank in shallow water just off Shackleford Banks on Jan. 11, 1886, near the now-vanished community of Diamond City. Shackleford Banks is the barrier island just across Beaufort Inlet from Fort Macon State Park. Historical accounts of its location put it due south of the DiamondCity Graveyard, which Smith said his team had not been able to find. Using equipment such as a magnetometer, which can detect metal objects such as the fasteners that hold a wooden ship together, searchers almost immediately found a large wreck where expected, just outside the surf line, buried under the sand. The Crissie Wright crew, soaked and freezing, apparently climbed into the rigging to stay out of the seas sweeping the deck. At least three crew members either fell or were swept into the sea, and the others began freezing to death, one by one. - GRECE – – Delos - The initiative was treated with some suspicion in the beginning. The reason being that its aim, the protection and promotion of ancient monuments, is not the job of private enterprise but the responsibility of the state. Nevertheless, Diazoma, a citizens’ movement that was founded by politician Stavros Benos and whose focus is ancient theaters, is now bearing fruit. An increasing number of citizens are being sensitized to the idea of ancient theater renovation, seeking out funding for their refurbishment and incorporating the ancient monuments into our daily lives. The result is that donation boxes have been set up to raise money for a number of monuments, including the theaters of Sikyon, Orchomenos, Sparta, Thorikos and Dodoni, to name but a few. In the case of the Ancient Theater of Delphi, the funding raised has reached the sum of 97,000 euros. It was the Ancient Theater of Delos, however, which recently came into the spotlight. Fresh efforts are being put into saving one of the country’s landmark theaters, whose construction began shortly after 414 BC and ended 70 years later. Originally, the theater had a capacity of 6,500 spectators. Today, it is in urgent need of improved maintenance. 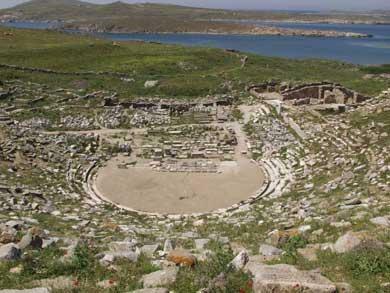 At a recent Diazoma event, Benos announced that the association’s board of directors is about to assign civil engineer Costas Zambas to work on a restoration study for the Delos theater. The project’s donation box currently contains 10,000 euros.